They were literally building the American dream. In the late 1940s, soldiers returning from World War II dreamed of the idyllic life: a happy family, a lovely suburban home. But the post-war period instead brought a housing crisis. In response, Lustron promised a dream house—signed, sealed, delivered. An innovative solution by Chicago industrialist Carl Strandlund, the Lustron house is made of prefabricated porcelain enameled steel, shipped and put together wherever you wanted—an IKEA home, if you will. Inside, families could sit around a built-in, glossy-surfaced table, eating home-cooked dinners in cozy domestic bliss. Lustrons were an ingenious 1940s invention: modern homes made of prefabricated steel sheets. Located in Chesterton, Indiana, this Lustron home is listed on the National Register of Historic Places. 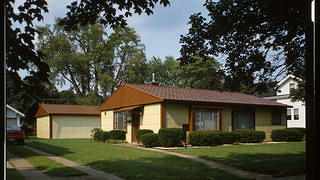 From 1948 to 1950, Lustron Corporation built thousands of these unique homes before falling to bankruptcy. The design, too, was exciting, combining modern minimalism and the function of a traditional home. 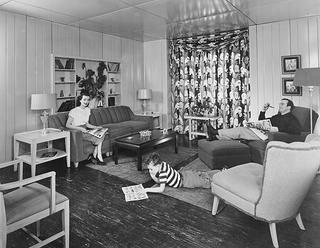 A happy family in a print advertisement showing a Lustron living room. A house contained over 3,300 parts, pieced together over an average of 350 hours, or 2 weeks. The skeleton was made of steel frames, welded into walls and roof trusses. The roof and walls were made of porcelain-finish steel panels, compressed with plastic seal for air-tight weather resistance. The technology itself began in the 19th century when European manufacturers started prefabricating cast iron for buildings. Strandlund thought of an inventive American use for enameled metal: solve the U.S. housing crisis. Strandlund devised an architectural panel which he patented, at first used for gas stations and restaurants. In 1947, he founded the Lustron Corporation to start producing houses. The company received a multimillion-dollar loan from the Reconstruction Finance Corporation to get started. Production began in 1948. 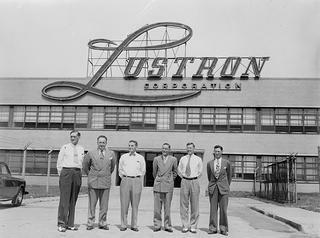 Taking over a former warplane manufacturing plant in Columbus, Ohio, the Lustron factory spanned over 1 million square feet of machinery, employing many war veterans. “They did everything from putting the porcelain on the steel to putting the bathtubs together, and they had employees who took the trucks out and assembled the homes on site,” says Wood. Employees standing outside the Lustron Corporation factory in Columbus, Ohio. By 1949, Lustron Corporation had 234 dealers in 35 states. Then the dream hit reality. Unable to contain costs, the company made less than 3,000 homes, out of the 45,000 promised. In addition, an investigation by a U.S. Senate banking subcommittee uncovered a corruption scandal within Lustron Corporation. Its loans were recalled, forcing the company into bankruptcy in 1950. An estimated 1,500 of these homes survive, some listed on the National Register of Historic Places. Lustron Preservation, an initiative of the former Midwest Field Office of the National Trust for Historic Preservation, now stewarded by the Ohio Historical Society, provides more information on the preservation and maintenance of existing Lustrons and their history. So as you look back to that nostalgic time and that promise of post-war properity, think of the Lustron, the dream that almost came to be.